14-year-old Ahmed Mohamed, a freshman at MacArthur High School in Irving, Texas, brought a homemade clock that he’d built that weekend to school on Tuesday. According to The Washington Post, Mohamed was known for his handiwork around electronics and built radios in his spare time. He brought the clock to show to his teachers, whom he’d just met weeks ago as a new student. 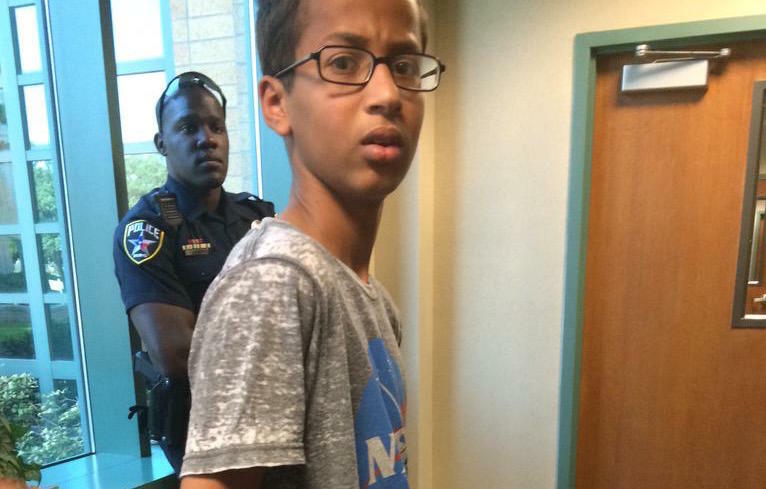 Since hearing of Mohamed’s story, Twitter has been set ablaze with the hashtag #IStandWithAhmed. There have been more than 350,000 tweets, from entrepreneur Anil Dash to TV personality Grant Imahara to even Democratic presidential candidate Hillary Clinton. Critics have said her comments have fueled the undercurrents of Islamophobia in the community, galvanizing a group who believes vehemently in an impending invasion of America by Islam. Others have claimed that a passion for Science beyond his years — amid a group of peers and teachers who don’t understand his talents — led to the arrest. The vocal outreach of students at MIT and employees at NASA who have supported Mohamed’s cause have drawn the conclusion that Mohamed’s passion for hardware, and his natural curiosity, were unfairly punished with an arrest.